No matter why you watched the first two installments of HBO’s 115-pound cards, you left happy. HBO might think that it was for Chocolatito Gonzales or Srisaket Sor Rungvisai, but ultimately that’s not the case. It was never the status of the fighters; it was the quality of the fights. In that, Superfly 3, from The Forum in Inglewood, Calif., was a let down. The buzz was smaller. The fights weren’t as compelling. It was a name. Ostensibly, it was the same format, but it wasn’t the same quality. And we all knew that. Juan Francisco Estrada (37-3, 25 KO) has a claim to being the finest Mexican prizefighter in the world. For 12 rounds Saturday night, he went about his craft as he has done his entire career. He punchedFelipe Orucuta (36-5, 30 KO) cleanly and in combination. He dictated tempo and geography. He won pretty much every exchange. He happened to be in the ring with a taller, awkward opponent. HBO’s announce crew would have you believe that he’s an ingrate, demanding more money for a product not worth the asking price. They’d have you believe that as they praise Andre Ward (no action hero), Estrada was suffering against a lesser opponent, and didn’t make a valid point. They’d have you believe many things. Narrative may drive speech, but viewers have eyes. And brains. And can make up our own minds. 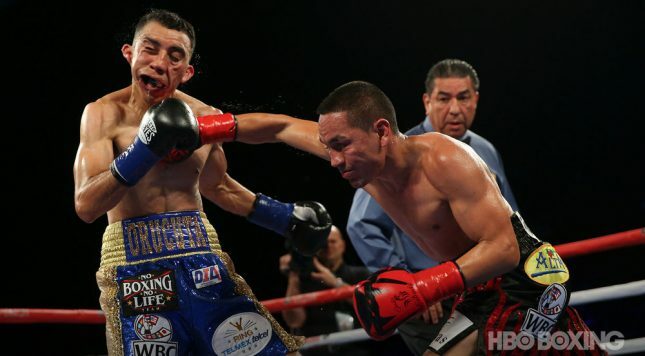 Estrada defeated Orucuta by unanimous decision, the judges doling out scores of 118-110, and 117-111 twice. TQBR also scored the bout 118-110. It wasn’t thrilling, but it was entertaining. Estrada will become an action hero when he must; Orucuta lacked the tools to force it. There’s nothing wrong with that. I’ll watch Estrada against anyone. He’s that good. I don’t need to fracture my taint with excitement to want to see someone ply their craft. In the chief supporting bout, Donnie Nietes (41-1-5, 23 KO) somehow got a split draw against Filipino countryman Aston Palicte (24-2, 20 KO). Palicte spent 12 rounds following Nietes around and eating counters. How in the sweet Jesus hell anyone could score that fight for him is beyond me. TQBR had Nietes winning 119-109. It wasn’t fun to watch or score. It just wasn’t fun. Nietes is a wonderful boxer, but the drama was never there. Period. The card opened with stalwart McWilliams Arroyo dropping a wide unanimous decision to freshly unretired Kazuto Ioka. Arroyo (17-4, 14 KO) is a wonderful fighter. He’s not the best in his class, but he will give anyone absolute hell. He is skilled, can punch, and is unafraid to get nasty when he needs to. Ioka (23-1, 13 KO) ate all of that and still complained of hunger pangs. Everything Arroyo did, Ioka answered him one better. It was a brilliant, technical fight. Blitz chess is always fun. It was the only fight of the evening that lived up to the card’s billing as Super. Inasmuch as fights can be competitive, but one sided, it was. Every exchange was intense. Every round was competitive. Ioka won pretty much all of them, but goddamn did he have to work.